Rhinitis is a reaction that happens in the eyes, nose and throat when allergens in the air trigger the release of histamine in the body. Histamine causes itching, swelling, and fluid to build up in the fragile linings of nasal passages, sinuses and eyelids. There are two types of rhinitis: allergic (seasonal) rhinitis and non-allergic (year-round) rhinitis. Who is at risk for rhinitis? People with asthma are at a higher risk for rhinitis. Allergic rhinitis is a common problem that may be linked to asthma. However, this link is not fully understood. 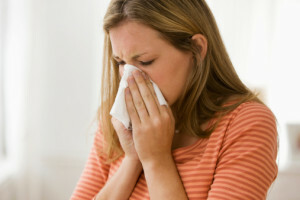 Experts think that since rhinitis makes it hard to breathe through the nose, it is harder for the nose to work normally. Breathing through the mouth does not warm, filter, or humidify the air before it enters the lungs. This can make asthma symptoms worse. Controlling asthma may help control allergic rhinitis in some patients.